Inspiring, affordable ceramics for your home is always a good thing, right! It’s one of life’s small pleasures that uplift our spirits don’t you think? First of all, let me wish you a wonderful and happy New Year filled with lots of precious moments with your loved ones, a sense of well-being and great, exciting projects. The end of 2018 was for us one of the best in many many years. I joked that nobody died this year but 2015 & 2016 were pretty awful for our family and I’m grateful we could end the year feeling lighter this time around. I also know that some of you have experienced painful loss (we all do at some point in our lives sadly) and I hope you will see brighter days in the near future. For what it worth, when my dad died, travelling was one thing that really helped me to keep my head out of the water and move on from the pain. To Mila‘s delight, Steve got a new job for a large company that sells cosmetics. Two days before flying out to New-Zealand we also signed a sales agreement for an old house in Pyla 2 minutes from the beach!! It’s gonna be a mama of a renovation project and where my main focus will be this year but I’m very much looking forward to transforming this space into a haven of peace. I’ve already created an Instagram account @CASAPYLA and Facebook page if you care to follow. Last but not least, I didn’t end the year feeling like a wreck, which makes me very proud of all the small lifestyle changes I’ve made these past few years. Losing weight on Intermittent Fasting definitively lifted an emotional weight as well as a physical one. It’s something that I have really embraced and are happy to do on a daily basis (feel free to ask me any questions if you need any bits of advice). 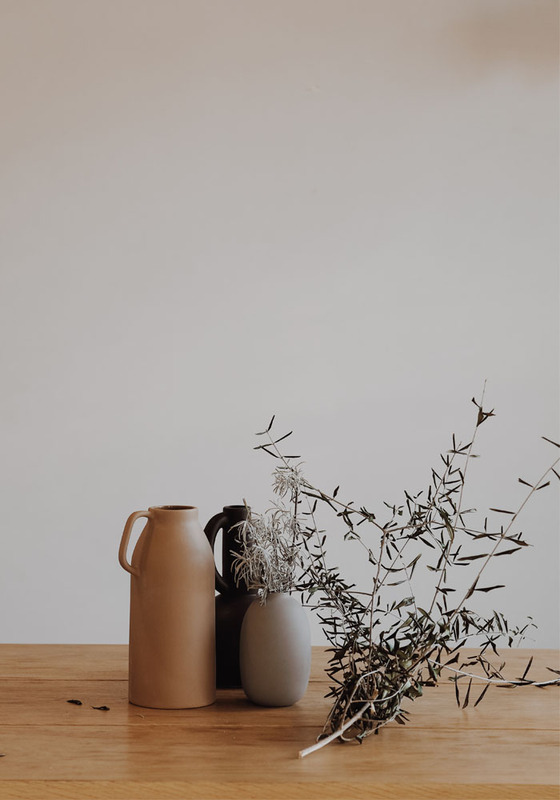 While styling our Christmas dining table last December and using this pretty grey stoneware vase (and this one here) I had at home, I came across this ceramic vase in camel in the sale (left on the picture). Sadly the camel is now sold out but it is available in black here and as a few other models are discounted, I thought you would love to know about them before it’s too late. I was planning to use it as a stand-alone. However, it works beautifully with my other black and grey vessels, don’t you think!? I hope you will manage to grab a few for yourself. These vessels are beautiful alone or as a cluster and very easy to style. Another thing I encourage you to grab in the H&M sale is one or two cashmere jumpers.I’ve just received mine and I couldn’t be happier. Hi Jo, thank you for your lovely comment and happy new year. So glad, a few lifestyle changes had a positive impact for you too. It’s so motivating isn’t it!? It’s Leon with an accent, which is a 30 min drive from Hossegor – we loved Waxed! I googled it after replying to you and realised it was in Les Landes. Never been there but I love Les Landes, glad you enjoyed Waxed, its a really cool place!